A strong ESB will support a broad range of standards, protocols, and adapters, enabling integration of services and applications written in any language or platform. A Best of Breed ESB doesn’t care if the services it is connecting are written in Java or C#. A Best of Breed ESB will enable the majority of integration work to be done through tools that are easy to learn and provide visibility into what is happening in the ESB, rarely requiring developers to write or debug code. Java and C#, the predominant languages in the enterprise, are nearly identical in syntax. Productivity is vital to any successful integration software. How long is it going to take to get your new initiative or application live? The software you choose should use graphical interfaces combined with advanced coding so you can automate when you need speed and customize when you need power. This will drastically increase your developer productivity and reduce the onboarding time for your .NET architects to work with other languages. Don’t spend your time building connections to an integration platform, look for a robust adaptor and connector network that quickly gets you up and running both with on-premises and in the cloud. When the need arises, an open SDK and 3rd party marketplace greatly increases the pool of applications and protocols you have access to. It’s critical to ask the question: how frequently are new connectors and adaptors created for my integration platform? Setting up an integration platform shouldn’t require you to “rip and replace” your existing IT infrastructure. Look for a solution that allows you to start small by building departmental solutions and then connect to a central core, or the cloud, scaling horizontally when you’re ready. Mission critical performance demands that your integration software seamlessly execute on its transactions. When your company grows, your integration solution should be able to scale, and do so securely. A unified integration platform allows for the capability to rapidly test different components and services, whether connecting new cloud services, simplifying logic on-premises or building APIs. This adaptable architecture enables productivity, reducing the time it takes to succeed in a new IT initiative or forces you to fail fast. Your integration solution shouldn’t require you “bolt on” another integration engine to work with Best of Breed applications, but instead empower your business with a robust adaptor network and easy to use connector framework. Connectivity needs around SaaS integration, SOA and API solutions will converge over time and companies will need a single platform to solve their enterprise connectivity challenges. The proliferation of SaaS applications and APIs has changed the IT landscape. Applications that you need to connect to now and in the future will be in a variety of languages and likely not in your datacenter. Limiting your next generation integration server by code base or deployment architecture will handcuff IT innovation, limiting your company’s ability to respond to future opportunity. Choosing the Best of Breed ESB will reduce connector headaches down the road and allow your business to start using IT as a revenue driver. 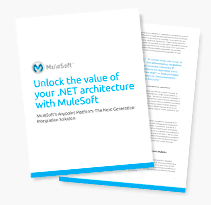 Interested in learning how MuleSoft’s Anypoint Platform can help you unlock the value of your .NET architecture?